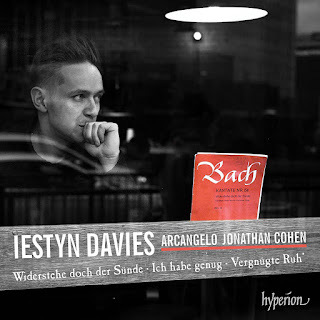 On this new disc from Hyperion, counter-tenor Iestyn Davies joins Jonathan Cohen and Arcangelo for performances of three of Bach's best-loved alto cantatas, Vergnüte Ruh, beliebte Seelenlust BWV170, Widerstehe doch der Sünde BWV54, and the alto version of Ich habe genug BWV82, and the ensemble performs the sinfonias from the cantatas Falsche welt, dir trau ich nicht! BWV52 and Ich liebe den Höchsten von ganzem Gemüte BwV174. The disc provides a fine opportunity to hear Iestyn Davies on peak form, joining with Cohen and Arcangelo to make engagingly vibrant chamber music with the voice very much part of the ensemble. Though historically informed performances, it must be remembered that Bach's altos were boys rather then men, and that whilst we benefit from Davies' superbly mature technique, the sound he makes is very different to that which Bach heard, though the challenging nature of some of the writing in the cantatas implies Bach had one or two good boy altos for whom to write. Vergnüte Ruh, beliebte Seelenlust BWV170 dates from 1726, one of three alto cantatas Bach wrote for Leipzig that year. The text is pretty forgettable, all about the contented rest achievable in heaven, but it seems to have inspired Bach. The opening aria 'Vergnüte Ruh' has a lovely solo oboe and Cohen gives a gentle swing to the orchestral rhythms. Davies sings with a superb sense of line, with just the right amount of edge to the tone, yet creating a finely contained performance. In the second aria there is some great recorder playing and a discreet sense of constant forward motion in the orchestra, with Davies unfolding an elegant line above. The final aria has some brilliantly showy organ playing from Cohen, with a remarkably perky orchestra accompaniment and a more sober line from Davies. Throughout, I was aware of Davies fine attention to the text, in both recitative and aria. The sinfonia to Falsche welt, dir trau ich nicht! BWV52 is engaging with some striking horn playing contributing to the richness of the textures. Widerstehe doch der Sünde BWV54, is one of Bach's earliest surviving solo cantatas, dating from 1715 when the composer was working in Weimar, and is scored for strings with divided violas to give a particularly rich effect. The text deals with the familiar wages of sin. A steady throbbing orchestral accompaniment provides vibrant support for Iestyn Davies lovely and very expressive vocal line, complete with some superbly shaped long held notes. The second aria, all about those who commit sin, has a striking downward chromatic phrased passed between instruments and voice, and Davies contributes some fine passagework here. The sinfonia to Ich liebe den Höchsten von ganzem Gemüte BwV174. is in fact an arrangement of the opening movement of Bach's Brandenburg Concerto No. 3 with Bach adding horns, oboes and bassoon to the existing string parts to create a strikingly rich texture. The performance is rather engaging, with a lovely sense of detail despite the richness of Bach's scoring. Ich habe genug BWV82 originally dates from 1727 and was written for bass soloist, a version for soprano followed, and then for alto in 1735, the version we hear here. The text refers to the Presentation and the Song of Simeon, with a strong expression of longing for death. 'Ich habe genug' has a lovely oboe solo, and a vibrant sense of the orchestral texture underneath with some remarkable detail yet all coalescing in a rich whole with Iestyn Davies floating an expressive line above. This engaging sense of intimacy continues in the second aria, essentially a lullabye, with Davies impressing with his haunting long held notes. The final aria is full of vitality, with a perky performance from all and some lovely full phrasing from Davies. Throughout Davies sings with poise and elegance, creating long expressive lines, though occasionally I was aware that the tessitura sits quite high for Davies, You could perhaps imagine the cantatas being sung with more intensity but I doubt that you will find singing as movingly beautiful as this. Davies is more than supported by Cohen and Arcangelo, there is a real sense of communal music making and a feeling of chamber music about it which has all the engaging vitality that we expect from Arcangelo.